We all know that brushing our teeth is critical to our oral health. But how important is flossing? We all know that brushing our teeth is critical to our oral health. But how important is flossing? Flossing removes plaque and debris in places that your toothbrush can’t reach. If left alone, this buildup of plaque can cause gum disease or tooth decay. So flossing should be a part of your daily routine just like brushing your teeth. Flossing does about 40% of the work required to remove sticky bacteria, or plaque, from your teeth. Plaque generates acid, which can cause cavities, irritate the gums, and lead to gum disease. Also, flossing allows you to reach all five surfaces of a tooth. If you don’t floss, you are leaving at least two of the surfaces unclean, allowing plaque to build up in between. Tooth decay and gum disease can develop when plaque is allowed to build up on teeth and along the gum line. Professional cleaning, tooth brushing, and cleaning between teeth (flossing and the use of other tools such as interdental brushes) have been shown to disrupt and remove this plaque. 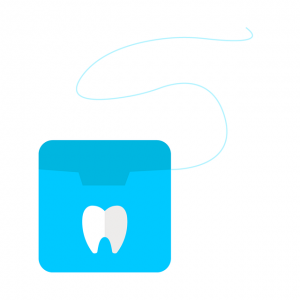 When you look at dental floss, you’ll notice you’ll find two types – nylon and single filament. You can get nylon either waxed or un-waxed, in a number of different flavors. Nylon floss is produced from numerous strands of nylon material, meaning that it might shred, tear, or snag in between the teeth if it gets caught on sharp spots on your teeth. Although the single filament floss is priced higher than nylon, it’ll slide easily in between teeth, even tight places. Regardless of the type of floss you choose, it is important that you floss to remove debris from your teeth and gums. The primary issue most people have with flossing may be the potential of bleeding gums. When you floss and slide the floss between your teeth and around your gums, the floss will rub against your gums, possibly resulting in bleeding. This is fairly common especially when flossing infrequently, but if it continues, you should consult your dental professional.